Wheel Fun Rentals is hosting its 7th Annual Pumpkin Patch, open every Saturday and Sunday from 10 am until sunset, September 29th through October 28th. The Pumpkin Patch will be located at Veterans Memorial Park, 6335 Portland Ave. South, Richfield, MN 55423. Enjoy mini-golf, an assortment of pumpkins, bounce houses, a full food and drink menu, and so much more. 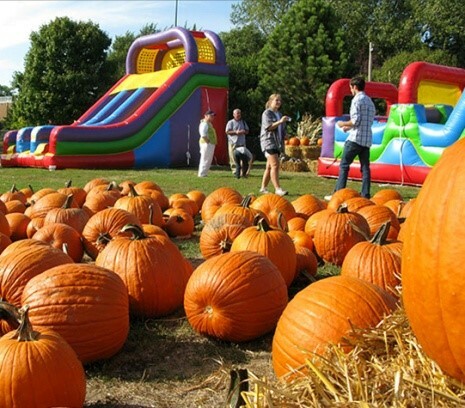 Richfield, MN, September 24, 2018 --(PR.com)-- Bring the whole family out to Wheel Fun Rentals’ 7th Annual Pumpkin Patch, open every Saturday and Sunday from 10 am until sunset, September 29th through October 28th. The Pumpkin Patch will be located at Veterans Memorial Park, 6335 Portland Ave South, Richfield, MN 55423. Enjoy mini-golf, an assortment of pumpkins, bounce houses, a full food and drink menu, and so much more. Activities include mini golf, a 22-foot super slide, bounce houses & inflatables, hay rides, bike rentals and more. Weave through the colorful fall foliage on one of Wheel Fun Rentals’ iconic four-wheel Surrey cycles that seat the whole family. Sort through farm-grown pumpkins of all shapes and sizes to find the perfect jack-o’-lantern. After you’ve worked up an appetite, choose from a full menu of malts, cones, a variety of grilled cheese sandwiches, espressos, and tasty seasonal treats like hot apple cider and hot chocolate. Wheel Fun Rentals’ 7th Annual Pumpkin Patch will be open to the public every weekend from September 29th through October 28th, from 10:00 am to sunset. Activity wristbands, that include entrance fee, start at $5 for adults and $8 for kids 2-17 years. Infants up to 2 years are free with a paid adult. Schools and other large groups are welcome to make arrangements for weekday visits by reservation. The Pumpkin Patch is a great opportunity for school field trips, offering a variety of kid-friendly activities. For group reservations, please call (612) 861-9348. Get a head start on the fall festivities by heading out to Wheel Fun Rentals at Malt-T-Melt for the 7th Annual Pumpkin Patch in Veterans Memorial Park. For more information, please visit: http://wheelfunrentals.com/RichfieldPumpkinPatch.